Click the button below to install on Chrome, Firefox, or Firefox Android. Visit the extended installation page for instructions on installing in Safari, Edge, or Opera. The Twitter interface is filled with numbers. These numbers, or metrics, measure and present our social value and activity online, enumerating followers, likes, retweets, and more. But what are the effects of these numbers on who we follow, what we post, or how we feel when we use the site? Inviting us to consider these questions through our own experience, Twitter Demetricator is a web browser extension that hides the metrics. Follower, like, and notification counts disappear. “29.2K Tweets” under a trending hashtag becomes, simply, “Tweets”. 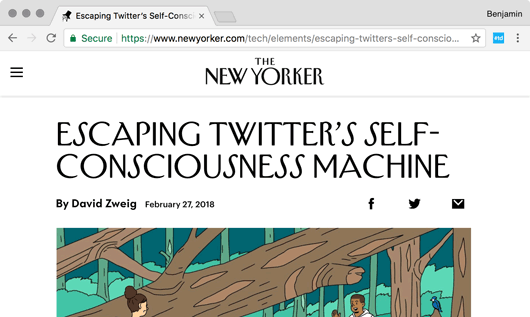 Through changes like these, Demetricator lets us try out Twitter without the numbers, to see what happens when we can no longer judge ourselves and others in metric terms. With this work, I aim to disrupt our obsession with social media metrics, to reveal how they guide our behavior, and to ask who most benefits from a system that quantifies our public interactions online. From “like” counts on Facebook to follower counts on Twitter, I often find myself enticed by social media metrics. How much do people like my post? How many retweets did I receive? Has my follower count gone up today? Further, when someone follows me, I will usually look to see how many followers they have before following them back. Why do I care? What makes these numbers attact my attention? And perhaps most importantly, why does more—more likes, more retweets, more followers—feel better than less? We see this desire for more play out in all aspects of life (steps on the fitness tracker, choices at the grocery store, etc. ), but it becomes hyper in the face of social media metrics. Never before has our every social interaction been quantified and shown back to us in real-time. The result is an extreme focus on whatever the numbers say, and a need to excel in metric terms. My previous research with Facebook has shown that visible metrics can make us feel more compulsive, competitive, and anxious. Further—without realizing it, we craft rules for ourselves based on what the numbers say, and these rules affect what we post, who we friend, and which posts we “like.” We can cautiously extrapolate some of these findings to the metrics on Twitter: that its counts make us competitive (why did that post get so many likes when mine only got a few?? ), compulsive (checking back frequently for updates to notifications, retweets, etc. ), and affect what we write on the site. However, “friends” on Facebook work differently than “followers” on Twitter. Friends are limited in number and tend to include known individuals, while followers are limitless and may include thousands or millions of unknown users/bots. Visible friend counts adhere to privacy settings and are confined to a user’s profile, while follower metrics are public and foregrounded on the profile page, home page, and in every user popup. This visibility combines with the lack of limit to turn follower counts into symbolic capital, or a central indicator of influence and/or prestige. Those who engage in propaganda and disinformation campaigns understand, at least intuitively, that follower and other metrics on Twitter create new opportunities to manipulate public opinion. There is perhaps no better example than the 2016 US Presidential election. We are learning more every day about how Russian operatives and data-focused campaign operations sought and seek to use social media to influence public opinion about the candidates and issues. Bot armies and humans alike are used to inflate follower metrics, to elevate specific hashtags, or to like and retweet posts with a specific viewpoint. These disinformation tactics work because we’re focused on the metrics and let them stand as an authority, as meaningful in and of themselves. We give up agency to the numbers, letting them tell us whether someone is worth listening to rather than reading and evaluating their posts on our own. We judge ourselves based on what the metrics say, and feel competitive when we fail to meet our expectations for like or follower counts. Even celebrities with hundreds of thousands of followers feel compelled to employ firms to inflate those numbers with fake users. Metrics activate our desire for more, yet “more” can never truly be achieved. “More” is not a firm target, but one that is always moving, always beyond where we are right now. When we consider the effects of visible metrics on Twitter or elsewhere, it’s important to remember that software systems are designed. Which metrics we see—and which metrics the corporation keeps to itself—are design decisions driven by a need for growing user engagement. Social media companies need more users and more posts so they can sell more data and show more ads, all towards creating more profit for their shareholders. To do this, they watch the metrics more than any of us, and use what they see to create interface and interaction patterns that encourage continued liking, posting, and following. With Twitter Demetricator, I aim to get inbetween the user and the corporation, enabling a renewed agency over the effects of visible metrics. With it, we can see for ourselves how the metrics affect our everyday experience of the site. Does another user’s high follower count influence your perception of what they post, or your decision to follow them? Are your like and retweet metrics changing how you feel about reactions to your latest tweet, or your plans for what to write next? And finally, who benefits from a system that constantly encourages all of us to evaluate and compare based on what the metrics say? Twitter Demetricator is free software that runs within your web browser, constantly watching Twitter when it’s loaded and hiding the metrics wherever they appear. This is true not only of those counts that show up on the user’s first visit, but also of anything that gets dynamically inserted into the interface over time. The demetrication is not a brute-force removal of all numbers within the site, but is instead a targeted operation that focuses on only those places where Twitter has chosen to reveal a count from their database. Thus numbers a user writes into their status, their profile description, etc. are not removed. For example, if the small text above a Tweet on the timeline says “Frank Pasquale and 4 others liked”, Demetricator will change it to “Frank Pasquale and others liked”. Under a trending hashtag in the “Trends for you” box, “29.4K Tweets” becomes “Tweets”. When you click on a tweet detail popup’s “Retweets” link, the text at top transforms from “Retweeted 47 times” to “Retweeted times”. You can still click that retweets link and manually count up everyone listed if you care about reducing them to a single count. But under the influence of Twitter Demetricator, that foregrounded quantification is no longer visible. These removals happen everywhere: on the feed, your profile, every user, “Likes,” or “Retweets” pop-up, etc. Users can toggle the demetrication, turning it on or off when desired. Its default state is on (numbers hidden). My article about the effects of visible metrics on Facebook, titled “What Do Metrics Want? 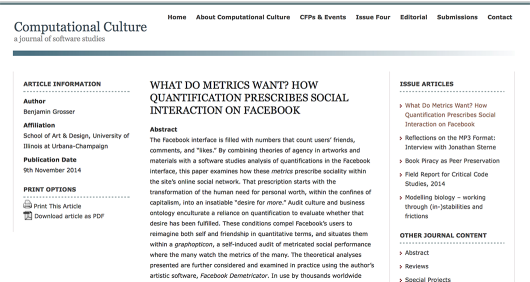 How Quantification Prescribes Social Interaction on Facebook”, was published by the journal Computational Culture. While Facebook is the example I use in that text, much of my what I’ve written applies to Twitter, and expands on concepts I’ve touched on above. How has Twitter Demetricator changed your experience of Twitter? Is the absence of numbers changing your interactions in any way? Do you focus on your own metrics less? Are you writing more or less tweets? Are you finding yourself pausing before acting, wondering what the hidden numbers might say? Which metric do most notice the absence of? (Or, to put it another way, if you toggle Demetricator off, which metrics are you most trying to see?) Why? For questions about browser support, (un)installation, updates, privacy, and more, please see the list of frequently asked questions. Twitter Demetricator is free and its source is open and hosted on Github. If you have suggestions for improvement, please submit a pull request or send me an email.